I mentioned in my Miami International Film Festival doc preview that Alison Ellwood and Alex Gibney’s “Magic Trip: Ken Kesey’s Search for a Kool Place” was not one of my most anticipated. I hadn’t heard good buzz at Sundance on the film, and I’m not a huge fan of Gibney lately anyway. Also, his doc on Hunter S. Thompson, “Gonzo,” was a huge disappointment for me, so I was expecting something similar here. Well, I found myself at a screening of the film last night, and I didn’t hate it. It’s far more satisfying than the Thompson film. But I also came away wondering what it’s really about, if anything. 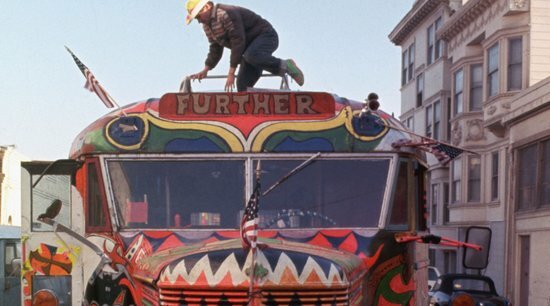 If it’s just a way of finally presenting the footage that Ken Kesey and the Merry Pranksters shot during their iconic 1964 psychedelic bus trip, I wish it was much simpler. It’s a shame the old films, which don’t look nearly as bad as I’d heard, don’t feature synched audio. That would have made for something great, left alone save for some expert editing to give it a narrative flow. Enough people have read Tom Wolfe’s “The Electric Kool-Aid Acid Test” to fill in the specifics of what’s going on, and if not then it could at least be a mere verite record of the time and events. But Gibney and company love voice-over, so I’d never imagine them letting material like this go without lots of narrated commentary. At least the voice-over stuff here is more directly from people involved and relatively contemporary of the footage itself. Of course, I wouldn’t have known it wasn’t recently recorded interviews if Ellwood hadn’t mentioned it after the screening. As far as it seemed to me, the audio sounded like something between oral history that too literally explains what we’re watching and reflective DVD commentary, in which the gang has more of a trip down memory lane than anything insightful to say (apparently these commentaries were recorded for a different project long ago, way before the existence of DVDs, with the subjects indeed talking as they watched the footage). In a way, it reminded me of what I’d just experienced at the “Mooney vs. Fowle” screening, but rather than being surrounded by the nostalgic viewers, they’re hidden behind the film, unseen but still audible. I also thought of the Merry Pranksters motto “nothing lasts,” which ironically isn’t the case: memory and romanticizing eras lasts a very long time. Other than having a chance to see the Pranksters films (even though they’re tampered with) and hear a very fascinating recording of Kesey on acid while participating in medical testing of LSD in the 50s (supplemented literally and artfully with animation, reminiscent of the undesired illustrations in last year’s “Howl”), I don’t see the point. Is its supposed to be a Kesey biopic? Another unneeded celebration of the 60s? A pseudo adaptation of Wolfe’s book? I guess we can later appreciate this doc more once an actual dramatic adaptation of “Electric Kool-Aid” is produced as promised/threatened. Otherwise, at least the young people who get giggly during mentions of being high and shots of naked butts and aren’t yet over the idealized bohemian thing, such as the girls next to me in the theater, they’ll enjoy it. I would have, too, about a decade ago. in turn spread the signal to the whole abdominal area.